In October of 2010, Ai Weiwei filled the turbine hall at the Tate Modern with 100 million handmade porcelain sunflower seeds. In April 2011, he was arrested by the Chinese government and held at a secret location in solitary confinement for 81 days. His passport was confiscated for four years and not returned until July, this year. 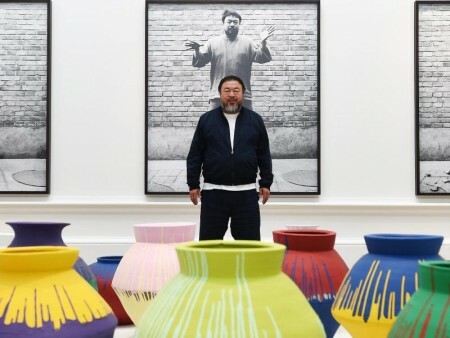 For the first time since Sunflower Seeds, Ai Weiwei has been able to travel internationally and oversee his own exhibition. Ai Weiwei at the Royal Academy (RA) is not the story of Ai the Activist or Ai the Artist, Ai the Architect or even Ai the Tiger. Ai Weiwei is the story of the man and how his love for China has not diminished, despite the treatment of his family, his friends and himself at the hands of the government. The work on display makes harsh criticisms of a government that restricts freedom of expression, but also shows devotion to the country, heritage and China’s people. 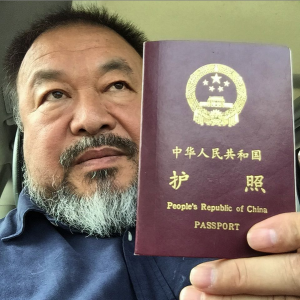 Ai Weiwei originally used his art to provide a social commentary on China. Now his entire life is a commentary on China, a sort of performance art. This transformation from critic to subject and back again is clearly displayed as you walk through the galleries at the RA. Ai collaborated very closely with the RA to create this exhibition. Without his passport, and little hope of receiving permission to travel, Ai designed almost every aspect of the exhibition from his Beijing studio. Observed by at least 15 CCTV cameras scattered around his compound, he used floor plans and video footage of the RA galleries to organise the retrospective, and his architectural skills are clearly displayed by the way the galleries become part of the work itself. Even the wallpaper is significant. 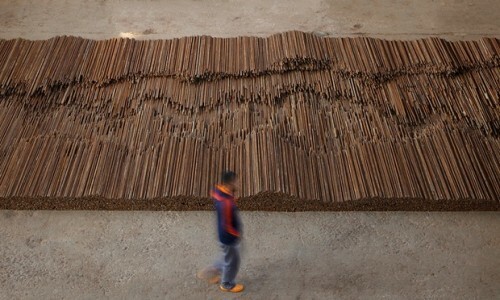 Upon entering the exhibition, you almost fall into Bed, a hardwood map of China sprawled across the floor like a duvet. Many of Ai’s works follow the theme of understanding and then re-presenting China in unusual ways. Bed, like all of his work, is multi-layered in meaning. Every aspect of the work is embedded with concept, from the material choice to the method and craftsmanship used to create the finished form. Although Ai’s stunning, sculptural work could be viewed purely as abstract art, its richness comes from gradually understanding how each layer of meaning relates to the next. After Bed’s broad introduction to China, the next few pieces of the Furniture series focus on Ai’s interpretation of China’s cultural identity. After receiving news that his father was ill in 1993, Ai returned to China and collected pieces of old temples and furniture. Studying the techniques used to make them he reassembled them to become ‘useless objects’, in his words. These useless objects speak about loss but are also strangely hopeful. Kippe, a bricolage of timber offcuts, looks like someone has chopped an ancient temple into firewood and stacked it back up again using a scaffolding framework. Despite providing a commentary on how China’s cultural history has been bulldozed, there is also a lightness of touch in Kippe, a suggestion that all things are impermanent and maybe life is just one big joke. Many of the pieces in the Furniture series express something of wonderful dualism of Chinese mentality, where several contradictory ideas can be all be true at once. Kippe is both old and new, it is a set of static frames as well as the potential of leaping into the future. It is also the loss of the past and retelling of history to fit the politics of the present. One of the most poignant pieces in the exhibition is Table and Pillar. Calmly composed, the pillar from a dismantled Qing dynasty temple has been carefully inserted into a Qing dynasty desk, speaking of craftsmanship of a bygone age. Table and Pillar is not just nostalgic but mournful of the literal loss of beautiful everyday objects, such as furniture, that are now mass produced in lower quality materials. The eye is drawn upwards, towards the holes carved in Pillar that originally held up beams but are now dusty, useless voids. Much of his earlier work is a critique on the loss of craftsmanship and cultural heritage of China. This commentary on loss changes abruptly upon encountering Straight. No longer pontificating on the broader societal loss of beauty in daily life, the exhibition focuses on the personal loss of children in Sichuan during the 2008 earthquake. Over twenty schools collapsed, killing more than five thousand children. Ai points out that corrupt practices had led to flimsy ‘tofu-dregs’ methods (a phrase that means shoddy construction) and builders were allowed to ignore safety regulations. Alongside years of investigation and interviews to compile a complete list of all the children who died that day, Ai Weiwei created his own memorial of the tragedy in Straight. A giant seismograph, Straight is a massive pile of re-straightened rebar pulled from the rubble of the schools in Sichaun. Straight is reminiscent of Maya Lin’s Vietnam War Memorial in the strength of emotion it evokes by showing each individual loss of life in the context of the overall huge scale of the tragedy. Straight marks the moment of the exhibition where Ai’s work stops focusing on the lost aspects of China’s history and starts focusing on the more immediate loss of the future potential of its people. The last few rooms focus on Ai Weiwei’s personal battle with the Chinese authorities. He has produced a series of smaller, symbolic items carved out of materials that imply value and tradition. Jade handcuffs and marble surveillance cameras are obvious references to the actions taken by the Chinese government to restrict freedom of expression. The comparison of the Chinese and Western publications of The Art Book, clearly showing that Ai has been literally written out of Chinese art history, is more engaging. Ai works better at a larger scale, but these smaller works do set the scene for his next piece, a series of giant dioramas called S.A.C.R.E.D. S.A.C.R.E.D. stands for supper, accusers, cleansing, ritual, entropy, and doubt. Each letter in the acronym refers to part of his daily routine during his time in solitary confinement in 2011. A deeply unsettling work of art, S.A.C.R.E.D. forces you to participate in Ai’s psychological torture by climbing up on a step and peeking into his miniaturised detention rooms, becoming yet another guard. The retrospective ends with Bicycle Chandelier. This sculpture is a welcome relief, sparkling with light and hope. Bicycle Chandelier is one of Ai’s experiments with light as a material, but it also folds in the cultural symbolism of bicycles and his own childhood memories. 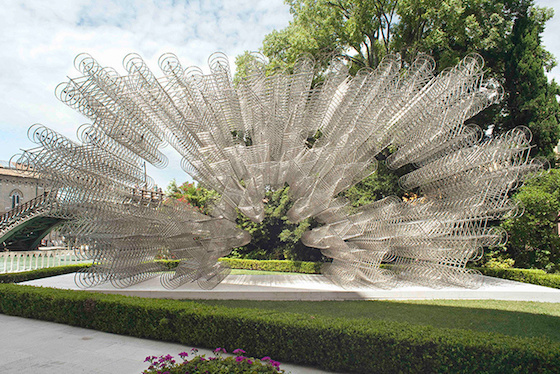 Using the same brand of bicycles that he rode as a young boy, Ai Weiwei suggests that the everyday actions of ordinary Chinese people will gradually make life better. It seems he is coming to terms with today’s China. You may not have democracy, but at least you can exercise your right to exercise. Ai has endured a lot and over the last five years he has changed as a person and as an artist. Some might say his work has become less radical in recent years. I would instead describe it as more nuanced. His view of the world has changed. Although no longer the young Han vase vandal, Ai still has a lot to say. The Chinese government has in effect given him a stage from which to speak to the world, and he is still critical of the lack of freedom his kinsfolk endure every day. If you want to ponder the more flexible and transient Chinese concepts of authenticity and fakes come see the Han dynasty urn in 1995 that Ai smashed. If you want to see how furniture can be repurposed as art, what a cubic tonne of loose tea looks like, or how rebar can make you cry, come to this exhibition. If you doubt Ai is a true artist, this exhibition should prove otherwise. If you think being wealthy and famous means you can’t be tortured by your own government, think again. If you only have twenty minutes to spare, don’t miss Table and Pillar, Fragments, or S.A.C.R.E.D. These three pieces give a whirlwind tour of Ai’s work as an artist, architect and activist, but are only fully understood in person as you engage directly with these sculptures and experience the empty space around them. Ai seems to take his responsibility seriously as a global commentator, but he maintains a certain lightness of touch about his fame. If you bump into him roaming Shoreditch, he happily takes charge of the inevitable selfie. From a grass mud horse rebel flipping off the authorities, Ai has transformed into a sunflower seed, one of the millions of Chinese people trying to make each day a little better than the last.